Last week, a picture of a pumpkin cheesecake popped up in my Facebook feed and I was like no. And then I went all Tracy-Morgan-from-Cop-Out. It’s July. And I want no part of pumpkin creamy salted apple Thanksgiving caramel candy corn baked casserole pumpkin anything. What I do want? Sweet, figure-friendly summer fruit. Doused in figure-unfriendly tequila. And we all know that fruit and tequila go together perfectly. One of my favorite throw-together summer side salads is watermelon, red onion, feta, jalapeno, and a big handful of cilantro, sprinkled with just a little salt and a squeeze of lime. It has everything you could want in a summer side, except tequila. Cut in larger chunks, it makes a fabulous salad. Cut in smaller dice, it’s makes a fabulous salsa for a no-cook chips-and-salsa dinner on the patio. So it’s no surprise that one of my favorite recipes from Pastry Queen Parties is a similar blend of flavors taken to the next level with a tequila-lime vinaigrette. It has everything you could want in a summer side, including tequila. The Pastry Queen serves her spiked watermelon salad in scooped out personal-sized watermelon bowls. So fancy. I opt for the no-fuss approach: a 12-year-old tupperware bowl that’s missing its lid. Watermelon and feta salad get a summery kick from a tequila and lime vinaigrette. 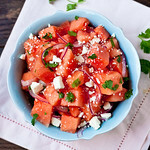 Lightly toss the watermelon, onion, cilantro, feta, and jalapeno in a large bowl. In a small bowl, whisk the lime juice, tequila, 1 Tbsp honey, salt and red wine vinegar together. Taste for sweetness and whisk in the extra honey, if desired. Pour over immediately before serving. If you anticipate having leftovers, only dress half the salad with half the dressing - the watermelon will water down the dressing the longer it sits. Dress additional salad as needed. Love the dressing on this salad! So yummy! 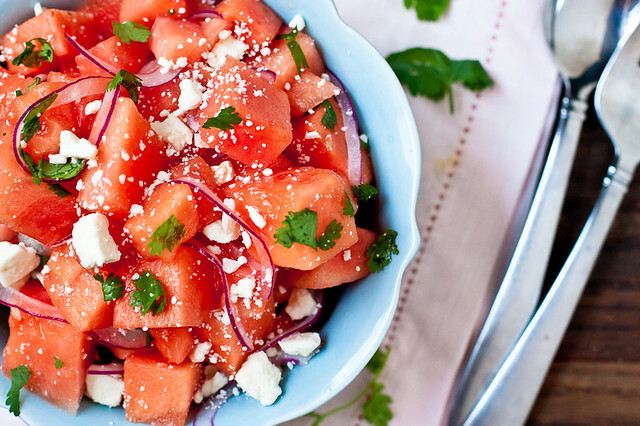 this is just the perfect summer salad.. love that you used watermelon. yum! I mean, I LOVE pumpkin and even I’m like HELLLLZZZZ NO. Have no desire for it right now. 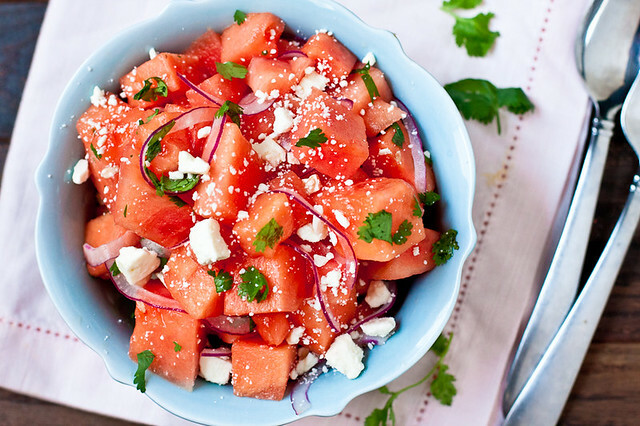 And all the desire for this watermelon salad! If you decide to do another Project Pastry Queen, I am there.